Downtown Germantown in November 2007, viewed from the intersection of Maryland Route 118 and Wisteria Drive, the Maryland SoccerPlex in May 2015, Downtown Germantown in January 2006, the Maryland SoccerPlex in June 2013, and the Maryland SoccerPlex in April 2013, and the Maryland SoccerPlex in May 2013, and Downtown Germantown in November 2007. Location of Germantown in مونٹگمری کاؤنٹی، میری لینڈ and the امریکہ کی ریاستیں of میری لینڈ. 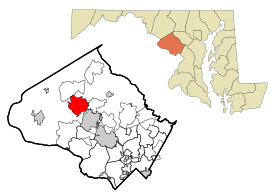 Location of Germantown in the U.S. state of Maryland.